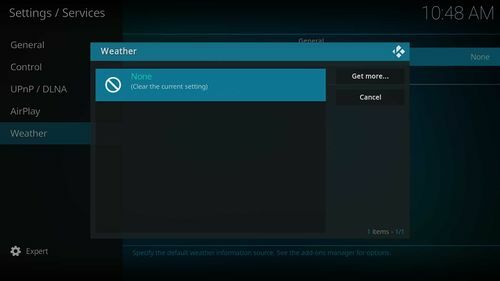 The installation of a Weather add-on is required if you would like to use the Weather feature of Kodi. The settings page for Weather can be accessed using either of two methods and both methods will access the same settings page as shown in the following images. 5. 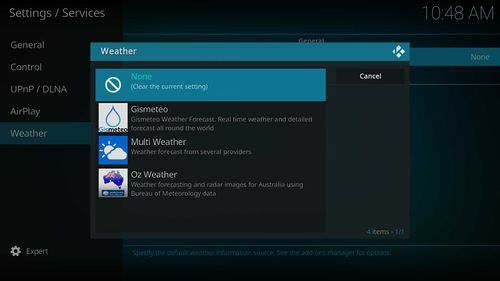 Once complete, you will be able to access the weather information from the Kodi Main Menu. The current weather is also displayed on various pages throughout Kodi. To change between celsius and fahrenheit go to Settings->Interface Settings->Regional then select your location under Region default format and/or change the Temperature unit to your preference.